The Conservatory at The Ritz-Carlton, Half Moon Bay recently underwent a renovation and reveals a new modern beach house look, menu and cocktail program. 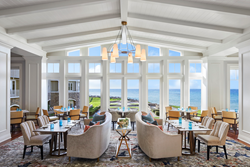 Perched atop a rugged ocean bluff overlooking sweeping views of pristine California coastline, The Ritz-Carlton, Half Moon Bay is thrilled to announce the debut of the resort’s newly renovated and re-concepted oceanfront restaurant — The Conservatory. Boasting a modern beach house aesthetic and a new vibrant menu curated by Executive Chef Xavier Salomon, the newly transformed restaurant combines fresh, homegrown cuisine and carefully crafted cocktails for an elevated, yet relaxed dining experience. The Conservatory is open daily from 11:00 a.m. – 11:00 p.m. Reservations are currently being accepted and can be made by calling (650) 712-7000. More information and full menu details can be found at ritzcarlton.com/en/hotels/california/half-moon-bay/dining/the-conservatory.